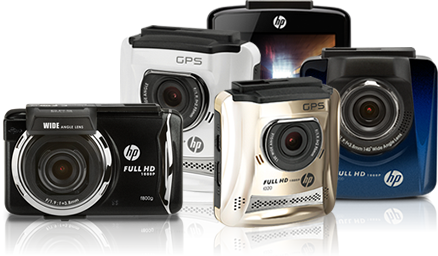 You’re ready for that “life happens” moment with the HP Car Camcorder f870g mounted in your vehicle. This premium Full HD 1080p camcorder with an ultra-wide angle lens and large aperture allows you to record your trip in amazing detail. The built-in GPS allows for real time tracking of speed and heading using the 2-quadrant display. The rear camera with 720p resolution helps you to watch any movement behind your car. When you are ready to playback your video on the PC, the SuperCar application (included) will enhance you experience with Google Map position tracking as well as speed, heading and G-force sensor information. The included car power adapter has a long cord for easy installation and assures the camera is always ready. Using Sony super low light sensor, the f870g can record excellent video quality no matter whether at day or night time, even at Zero lux surroundings.The premium f870g can be comparable to a 24-inch computer monitor resolution. It’s embedded with an exclusive image processor which supports Full HD at 30 frames per second, and provides an ultra-wide view angle at 155 °. With 6 layers of glass lens, it makes all details clearly visible and impressed. Instead of providing redundant features, we are more concerned about your daily using experience. The f870g comes with ADAS features such as Lane Departure Warning System (LDWS), Forward Collision Warning System (FCWS), and Driver Fatigue Alert. Take your driving safety to the next journey with f870g, a car camcorder that incorporates truly useful ADAS. Do you still worry about the ticket for mindless over-speed? Just install f870g, you’ll get away from fine. Embedded GPS module and pre-installed speed camera datum (regional) is an add-on value of f870g. You can also manually add speed camera position if that is not in the datum. Enjoy your journey without worries! f870g conducts parking surveillance through collision detection and motion detection. Inner three-axle gravity sensor can record and store the images before and after collision as evidences when cars are collided. HP also develops motion detection technology which on standby can automatically record people and objects before lens when cars stop. We seek to keep you safe around the clock. This is the introduction of product features. The actual feature is the standard.